Recent storms brought significant improvement to drought conditions in western Colorado as snowpack increased in the area. While the snowpack improved, long term impacts remain uncertain according the National Drought Mitigation Center. Recovering from the ecological damage could take years. Exceptional drought - the worst category - receded from most of Montezuma, La Plata, Archuleta, Dolores, San Miguel, Montrose, Ouray, Gunnison, Hinsdale and Mineral counties, replaced by extreme conditions. San Juan County remains fully engulfed by exceptional drought. Extreme conditions pulled back in western Huerfano and Custer counties, as well as northern Costilla and a sliver of eastern Alamosa counties. 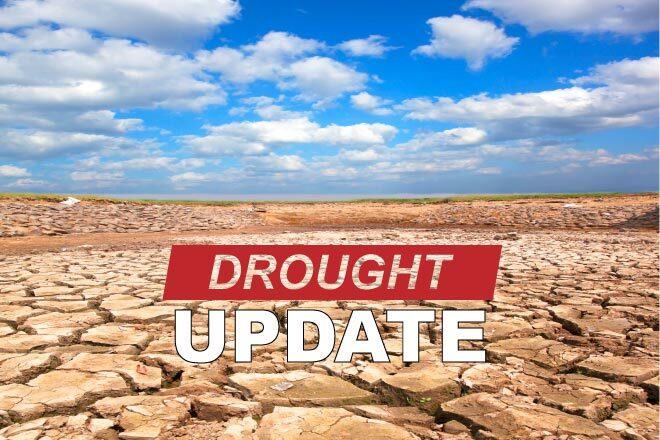 Fremont County saw remaining extreme drought shift to severe, as did a small portion of northern Saguache, southeast Chaffee and southwest Las Animas counties. 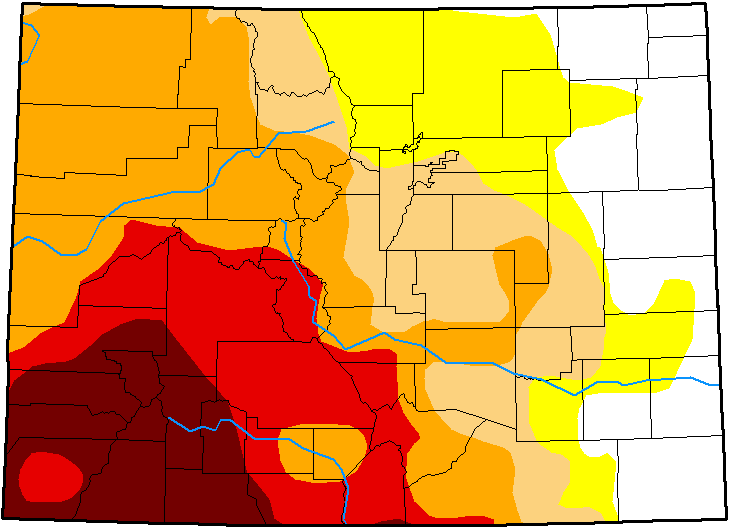 Severe drought was replaced by moderate conditions in large portions of Routt, Rio Blanco, Garfield and Mesa counties. All of Moffat County transitioned from severe to moderate drought. 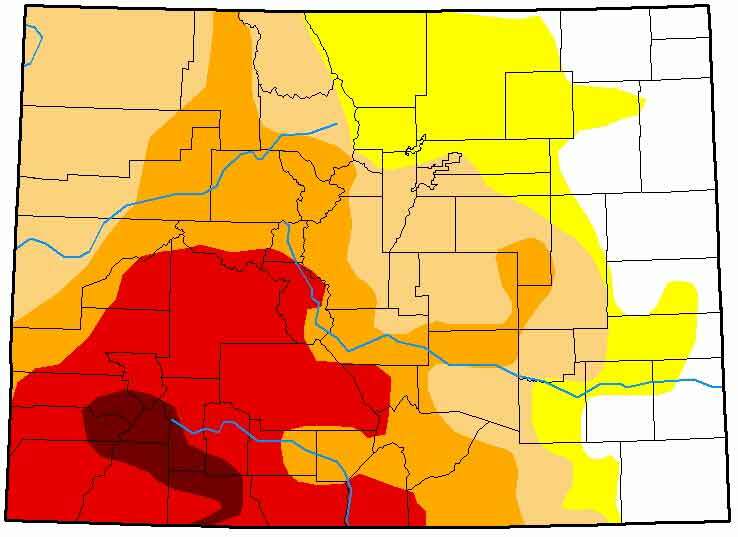 A small area of northeast Routt County was the only part of Colorado to see conditions degrade, moving from moderate to severe drought. Overall, 32 percent of the state - mainly eastern Colorado - was drought-free or abnormally dry, unchanged from the previous week. Moderate drought expanded to 26 percent of the state, up from 15 percent but reflecting overall improvement. Twenty percent of the state was in severe drought, down from 28 percent. Extreme conditions increased from 15 percent to 19, while exceptional drought dropped sharply from 11 percent to three percent. One year ago, just one percent of Colorado was drought-free, while 24 percent was abnormally dry. Moderate drought covered 47 percent of the state, while severe conditions covered the remaining 29 percent. Colorado's river basins continued to show improvements in snow water equivalent - the amount of water in the snowpack. The Arkansas basin leads the state at 131 percent of median, up from 123 percent one week ago. 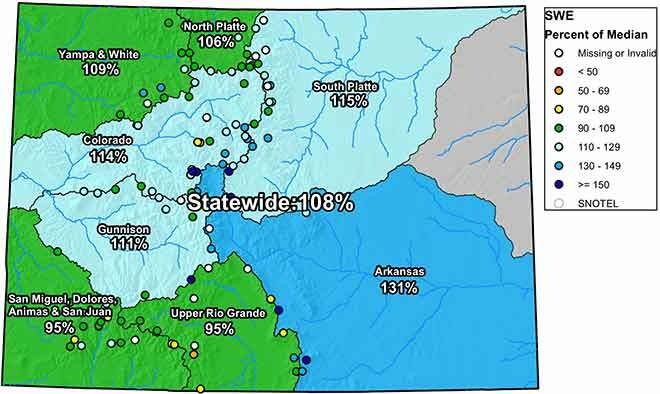 The South Platte basin increased from 111 percent to 115, while the North Platte basin dropped from 106 percent to 101. The Yampa and White basin increased from 106 percent of median to 109. The Colorado basin moved from 107 to 114 percent. In the Gunnison basin, snow water equivalent moved from 105 percent to 111. The Upper Rio Grande basin jumped from 83 percent to 95 percent. Slight improvement was noted in the San Miguel, Dolores, Animas and San Juan basin as snow water equivalent moved from 93 to 95 percent. Statewide, snow water equivalent increased from 102 percent to 108 percent of median for this time of year.